You'll feel proud, and I personally guarantee the ovation. Skip the album, but do get a hold of the Pyaar Kiya Toh Darna Kya track for sure. 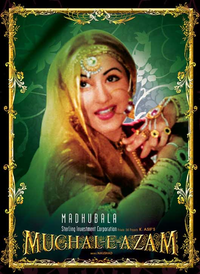 Mughal-E-Azam is a must for every moviegoer. Here's a prime example of pure, unadulterated cinema! Mughal-e-Azam is as classic a film as they come, and its colour incarnation is no different. It is not clear whether the enchanting/captivating story of Salim-Anarkali is a myth or reality but it has captured interest of people over generations.